Is Twitter bringing us closer together? Twitter has been in the news quite a lot recently: Anthony Weiner’s inappropriate tweet to one of his followers; Wayne Rooney posts a picture of his hair-transplant; the whole Ryan Giggs keruffle trying to stop information about an alleged affair from leaking (I feel all journalistic by using the word “alleged”); Tyneside council gets Twitter to name an anonymous user who had been leaking information; the UK’s attorney general warns that Twitter users who breach injunctions will be prosecuted; and the fact that Twitter was the media where first reports of Bin Laden’s death appeared. The sudden emergence of all of the above legal and newsworthy events is no coincidence, and can be explained by what has been going on with Twitter in the last few months. Twitter usage has been steadily going up, reportedly there are more than 500,000 new accounts created every day, 13% of adults in the U.S. use Twitter (up from 8% in November ’10), while Twitter now amounts to 17% of all sharing traffic online (tied with email). Moreover, the cultural presence of Twitter increases steadily as well, it is now common to see hashtags promoted in BBC and American broadcasts. The Royal Wedding played a large role in the growing cultural relevance of Twitter, with several news organisations using Twitter to measure the public’s reaction. Unfortunately, with growth in popularity also come some of many problems that we are just beginning to notice. News organisations are now using Twitter as their vox populi tool of choice. I must admit that I have never been a fan of the vox populi, I don’t care what a random person taken from the street thinks about what is happening at the moment. That is precisely why I have Twitter, and I do not want it filtered through by a newsreader. Even worse, Twitter memes and events are now being used by lazy journalists to fill spaces in their unending news coverage. Similarly, it is clear that people are just coming to grips with the technology, and we can expect to see many more blunders such as Weinergate. The above is self-explanatory and can be seen in countless blog posts around the Web. I am more interested in expressing just how much Twitter is changing the media environment. It is odious to point out that Twitter is not Facebook, but it really has to be repeated. Facebook is for the people you know or knew, Twitter is largely designed for following people you don’t know, or rather, in Twitter you connect to people you wish you knew, while on Facebook you connect with people you wish you did not know (in the unlikely case that one of my FB friends is reading this, I am merely kidding… sort of). This is why celebrities have taken to the Twitter bug with such gusto, it is mostly designed as a unilateral communications tool. True, you can have conversations on Twitter, but Twitter works best as a news sharing tool. In my opinion, the reason for Twitter’s success can be found in network theory (warning, this is the subject of my upcoming book). In particular, there are some very interesting things happening with the social graphs and the amount of followers, which lead me to believe that Twitter is a scale-free network, and also that it is successful because it reduces network pathways. This is what is known as the “rich-get-richer” effect. By 2009, only 40 individuals had more than a million followers, while today this threshold lies at 382 (Richard Branson is the latest Twitter millionaire). The above chart is made more relevant when one considers that by December 2010, 74% of all Twitter users had less than 10 followers. While not every skewed graph is an indication of the presence of a power law, studies seem to indicate that there is indeed such a characteristic in the amount of people being followed. While these statistics are noteworthy on their own, in my opinion what is happening is something more interesting. Twitter is said to have crossed the 200 million user threshold. 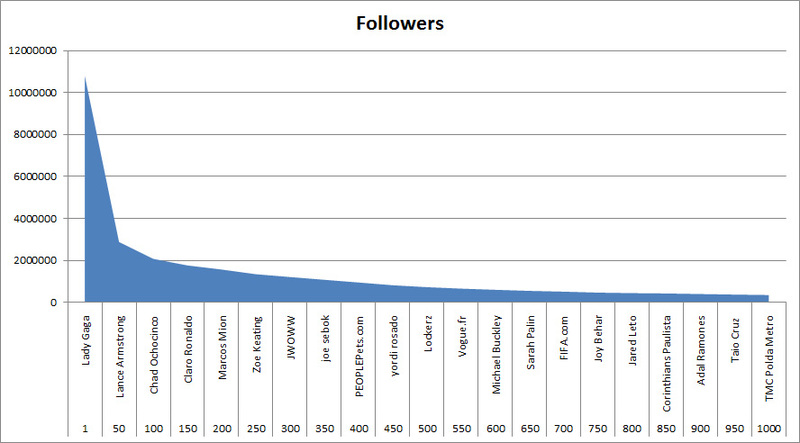 Of these, only a small minority are “celebrity” Tweeps, as the above chart indicates. Then there follows a smaller section of mid-chart Twitter users that conform a second tier of elite user (for example, with 1,266 followers, yours truly is ranked at #141,800 according to TweetCounter). It would seem then that the vast majority of users have very few followers, but follow those minority communicators, so the amount of people who are being listened to is small in comparison to the overall environment. What seems to be taking place is that people are using Twitter for three main purposes, to post personal stuff, to post links to news, and to join conversations. The fact that Twitter traffic jumps considerably during massive events would seem to indicate that following and follower ratios are just part of the equation. You do not need to follow someone to participate in a hashtag, and the shared sense of community is one of the things I enjoy the most about Twitter. A recent Pew study would seems to corroborate this trend, and the perception that Twitter is just about people telling others what they ate for dinner is completely untrue, it seems that at least 62% of those we queried said they post updates related to their work life, activities or interests, and 55% post news items. The above is an indication of why I think Twitter is bringing people together, but there is an even more interesting phenomenon, and this is because I think that Twitter is really shortening the intervening paths in social structures. According to the theory of six degrees of separation, everyone in the world is separated from one another by six people in normal social conditions. This is based on an experiment by psychologist Stanley Milgram, who found that it took an average of six people for a package to get from a random sender to a target they did not know. What is happening with Twitter is that when you follow someone famous, you are in fact bypassing the normal social pathways, and you are in fact creating a direct connection. The Anthony Weiner scandal is precisely a result of this, where a famous parliamentarian was able to connect to “fans” through Twitter in a direct manner (must resist double entendre, must resist!). I have seen this plenty of times, as there are people who often get direct responses from famous Tweeps, where in other circumstances it would be impossible to connect to them so directly. So, the plea to get Neil Gaiman to retweet something may sometimes pay big dividends. But there is also a psychological element. When you see a tweet from a person you admire about their everyday life, you feel closer to them. This is a complete fiction, in fact you are not closer to that person than you were before, but the sense of familiarity definitely exists. Twitter therefore is a huge marketing tool. 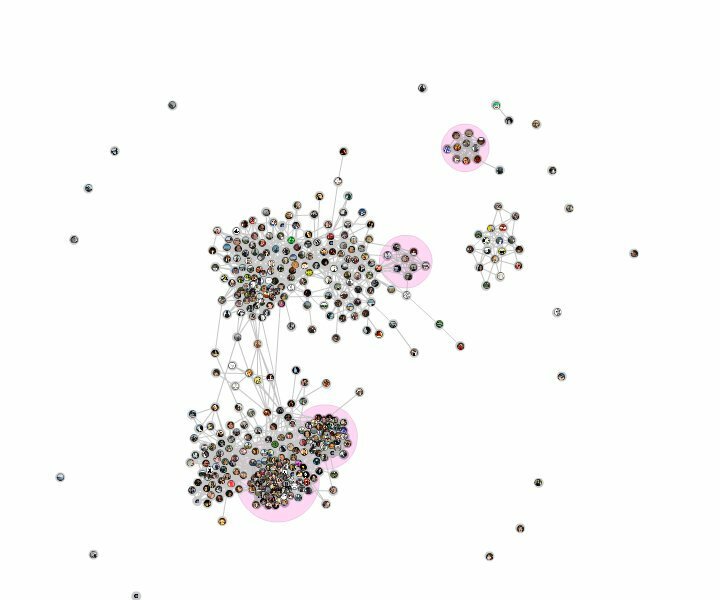 In this graph the geographical and thematic separation is even more stark, with my pre-academic network clearly separated from my post-academic network. 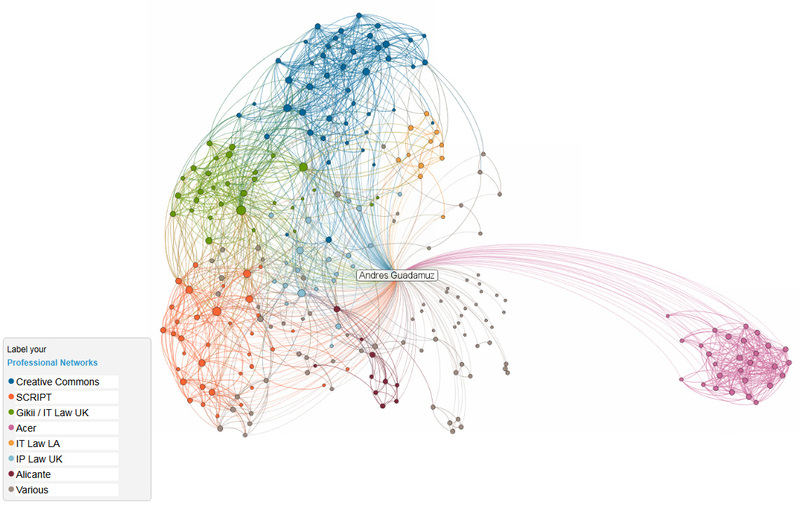 This leads me to believe that the very nature of the network is different in all instances. FB and LinkedIn rely much more on real world contact, while Twitter is clearly a network that works in an entirely different manner, which explains why it has been growing with completely different trends to those found in other social networks. In fact, there seems to be a large disconnect from one network to the other. While some people keep their FB and Twitter streams synchronised, I would say that at least in my experience there is very little cross-pollination between the two. My Twitter followers are an entirely different type of people than my FB friends, as I have been discovering since rejoining the latter. I will not try to hypothesise whether what is happening with Twitter is a good thing, I personally prefer it to the other social networks, but your mileage may vary. One thing is clear, Twitter is indeed bringing people closer together, albeit in a virtual fashion. I will not go as far as to claim that Twitter is changing society, or that these changes will have an effect in the real world. It is a powerful communication tool, particularly a very powerful branding tool. It will not change the world, but it may still change the regulatory role of intermediaries, as the amount of litigation arising from it continues to increase. Must leave now, I have to tweet about this post.